IFMSA Programs are centralized streams of activities, which are organized by IFMSA National Member Organizations (NMOs) and IFMSA internationally. IFMSA Programs address problems within a specific field that we as medical students and global health advocates stand up for while connecting local, national and international activities and opportunities that contribute to the final outcome. All IFMSA Programs connect the work of NMOs locally and nationally with the IFMSA vision and mission. NMOs decide which programs are to be adopted by IFMSA by voting on the Programs proposed by the Executive Board during the General Assembly. Programs are led by Program Coordinators and supervised by the IFMSA Standing Committee Directors and Executive Board to ensure their quality of implementation, consistency and sustainability of the programs. It is important to note that one of the major aspects of IFMSA Programs is to ensure a way to measure the impact of IFMSA and its NMOs on the societies we serve. All NMOs and members of NMOs locally and nationally are encouraged to join an IFMSA Program by enrolling their activities, whether that be projects, campaigns, celebrations, workshops, events, trainings or theme based publications. 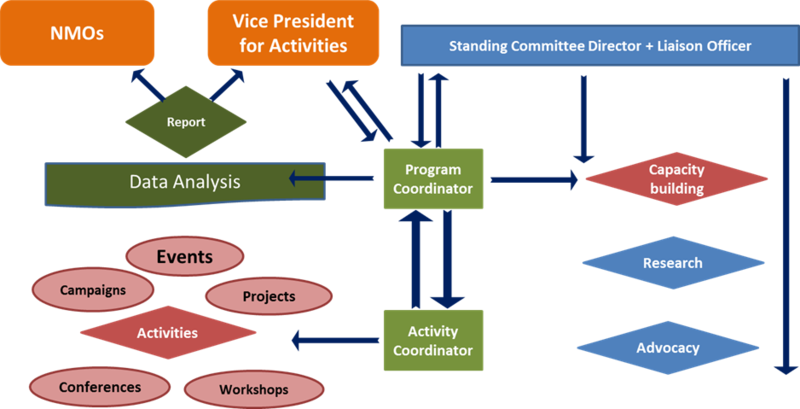 These activities are coordinated by Activity Coordinators locally, nationally or internationally with the help and support from Program Coordinator and the relevant Standing Committee Director. Internally, these activities dont need to be just projects, campaigns, events, etc. but different research and capacity building activities as well as organized advocacy efforts on local, national and international level. IFMSA Programs encompass mutual efforts of the IFMSA Team of Officials, Program Coordinators and National Member Organizations (NMOs) in addressing different global health issues, including medical education through a wide range of activities related to capacity building, research and advocacy. IFMSA Programs are strongly linked with the work of the IFMSA Standing Committees and other capacity building streams in IFMSA ensuring that Programs receive the needed support in terms of scientific background and basic studies. Having a centralized stream of work in each field allows our Federation to monitor and evaluate the impact of mutual efforts of all NMOs towards solving emerging global health issues. IFMSA Programs also serve as a network between NMOs activities including them on a bigger picture corresponding to the role of IFMSA as a network of NMOs. With the IFMSA Impact Report, IFMSA showcases its position within the global society as a Federation by proving a needs assessment for other organizations working in a similar field, while increasing the organizational credibility. Interested? Join a Program today!